What statistical data is available for the comparative fertility of different ethnic groups within the US, UK and France? "What statistical data is available for the comparative fertility of different ethnic groups within the US, UK and France?" Well this varies from country to country. The US data is pretty systematic, and can be found by following through the annual births links here. For the UK data is available, but researchers have to dig it out. One example can be found here. In the case of France my impression is - someone please correct me if I am wrong - that there is no official data whatsoever, and researchers have to reconstruct fertility rates by using indirect approaches, such as you can find in this classic piece of research (I don't know whether, despite your internet name you read french) by Toulemon and Mazuy. 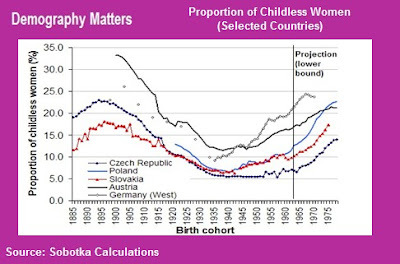 If you look at the chart entitled "Proportion of Childless Women by Birth Cohort," the childless percentage for women born in 1975 is about what it was for women born almost a century earlier. Wikipedia has a breakdown of the French tfr by ethnic group, at least from 91-98. 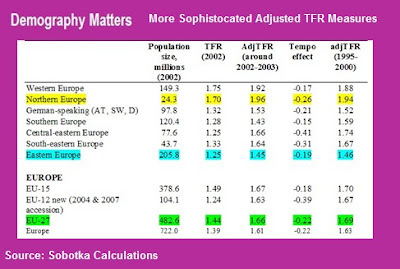 Women born in France had a tfr of 1.7, whereas immigrant women had a tfr of 2.16. European immigrants tended to have lower fertility than French natives, whereas North African and American immigrants had higher fertility levels. Unsurprisingly, Turks got the crown. An excellent report came out on the fertility situation in the UK recently showing 1) that 25% of all births are to foreign mothers and 2) the breakdown of fertility rates by country of origin. I seem to recall that Pakistani fertility rates were through the roof. Shouldn't be too hard to google if you have the initiative. 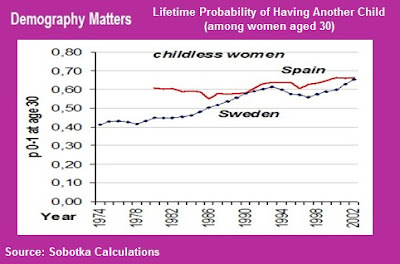 "If you look at the chart entitled "Proportion of Childless Women by Birth Cohort," the childless percentage for women born in 1975 is about what it was for women born almost a century earlier." Oh yes, I think this would be the point. These cohorts were to some extent the first world war cohorts, were women would remain spinsters due to the shortage of men to marry. I say to some extent since in some countries there may always have been countries were more women remained unmarried, I don't know enough to go as far as to say that. Of course, during the first half of the 20th century this isssue was masked by the relatively larger number of 3rd, 4th births etc among the women who did have children, so fertility remained highish. Now this is not the case. The point I think would be, that we are back were we were, but this time there hasn't been a war. 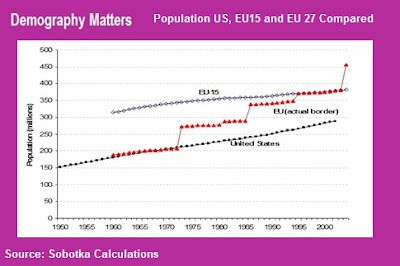 Before I read your analysis of Sobtka's work, I'll guess that he is pretty optimistic when he says that "The fears of European population implosion seem exaggerated ". I rather would say that it seems too underestimated! May reference hereby are not statistics but the situation in the field where I see way too much boys and girls in 30thies without any plans of establishing a family. "I rather would say that it seems too underestimated!" Well, if we are talking about the impact of these changes on economy and society, I would agree with you, Sobotka does seem to undetrestimate the significance and importance of some of the changes that are taking place, and in that sense he is moderately critical of a demographer like Wolfgang Lutz (who is of course his colleague in the Vienna Institute), since Lutz doesn't seem to underestimate the importance of all this. But I wanted to draw attention to the details of Sobotka's analysis rather than his own opinions, since I think he works quite professionally, and that the details are interesting. I would say I am trying to get at 2 points. 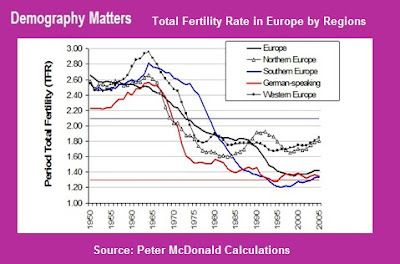 1) Differential fertility rates do matter. So while it is not true that ALL of Europe has a big problem, some countries ane regions evidently do. So we need to be more discriminating in the use of arguments. 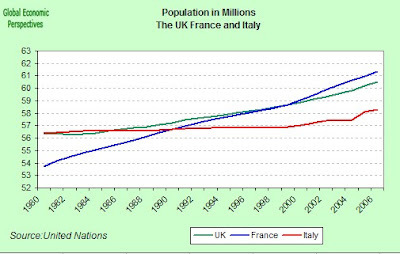 France obviously has a reasonably healthy demographic profile, and if Claus and I are right may well weather the coming recession rather better than Germany and Italy do. It will be an interesting test to see whether or not this is the case. At the moment demand in France is holding up quite well, but I am sure she will follow the others down at some point, the question is how far down, and for how long. 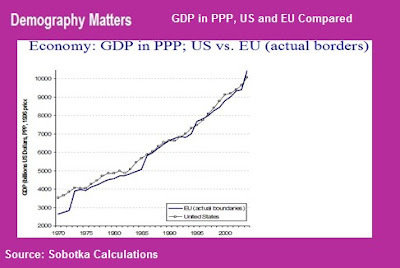 This is the whole point about the charts on GDP at the end of the post. ii) Immigration doesn't solve the low fertility issue, but it can help plug gaps during the postponement process. But.... to do this adequately you need immigrants from higher fertility societies, not lower fertility ones. Eastern Europe is a case in point, but Iran or Turkey (where fertility now in both cases is below replacement) are hardly ideal. Randy is doing some work on Estonia right now, and Estonia suffers from quite low fertility. Estonia receives immigrants, but from Russia. 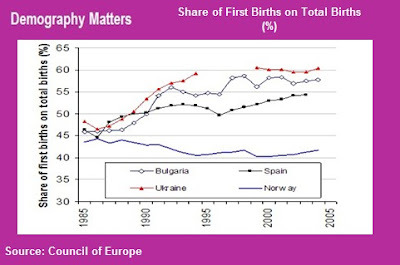 European Russians have lower fertility than Estonians, so rather than raising fertility they lower it. Of course the big issue which then looms is the extent of the cultural distance between the sending and the receiving culture, so evidently there is no "ideal" solution to this problem. The only real solution is to find a way to raise fertility in the longer term, since I don't mind saying it outright: what is happening now in Germany is completely unsustainable. I plan on making the Estonian research Edward's talking about into a blog posting, hopefully sooner than later. 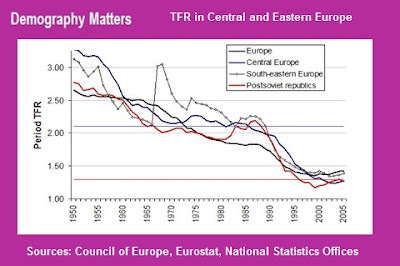 Suffice it to say that not only have ethnic Estonian TFRs been consistently 10-15% higher than Russophone TFRs since the 1950s or even 1940s and Estonian mortality rates significantly lower than Russophone mortality rates, but that Russophones living in Estonian-majority counties seem to adopt demographic behaviours relatively closer to those of ethnic Estonians. principle is still intact in American nationality law, less so in French nationality law since 1992 reforms. If one wants to remain in a country with a jus soli citizenship law, why not become a parent and count on not being separated from your citizen child? This incentive won't exist in later generations. fertility processes, then, likely a combination of cultural and political factors. Russia will be an interesting case in point. Could that country be the second country after Estonia to climb out of the lowest-low fertility rates? In 2007, Russia had more than 1,6m births, up by 125 000 from last year and the highest ever since the Soviet collapse. Russia could be, and it's worth noting at present that some subpopulations in Russia--the Chechens, for instance--have above-replacement TFRs. I wouldn't bet on it, if only because families in Russia are characterized by the same high marriage rates and low rates of childbearing that seem to contribute to low fertility in southern Europe and elsewhere. Excellent point on the jus soli incentive, Randy...I quoted you here. Marco raises a good point. "Russia will be an interesting case in point. Could that country be the second country after Estonia to climb out of the lowest-low fertility rates?" 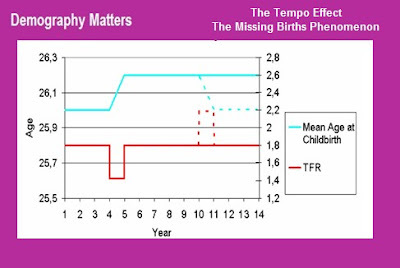 The actual volume of births may be quite an unreliable indicator about longer term changes in fertility, since, as I say, in part it depends on postponement rates and in part on the size of earlier generations. So I think we will need to wait to see longer term trends here. However Russia is one to watch. Randy's argument about the ethnic sub-components in Russian fertility also seems relevant. Wikipedia has a breakdown here, and obviously the Chechens stand out, though since they are such a small proportion of the total population (see Wikipedia here) they are unlikely to exert a very big impact on the aggregate number. More important may be the impact of fertility from the main migrant groups, who are now lead by Uzebekistan, Tajikistan and Kyrgyzstan. Getting presise numbers is hard, but an estimate of the importance of this phenomenon can gleaned from an October 2007 report by the International Fund for Agricultural Development (IFAD)which highlighted the dependence of these economies on remittances sent back by migrants, and in particular: Tajikistan and Kyrgyzstan. IFAD says that money received from labor emigrants and other nationals abroad was equal to roughly one-third of the Tajik and Kyrgyz gross domestic products - 36.7 and 31.4 percent, respectively - in 2006. The IFAD also noted that Uzbeks abroad sent about $2.9 billion back home - representing about 17 percent of Uzbekistans GDP in 2006. It may well be that many of these migrants are irregular, and unlikely to become Russian citizens, but their children may well be born in Russia, and thus show up in the annual birth statistics. Something similar has happened in Spain, although Spain is steadily opening the doors to the regularisation of irregulars. So it would be interesting to know just how many of those extra 125,000 babies were born to migrant mothers. This would then give a better idea of what was actually happening to native Russian fertility. Another situation which it occurs to me would be worth looking at is Greece, since Greece has received quite a lot of migrants since the late 1990s, and the vast majority of these have come from Albania where fertility rates are - at least for the time being - higher. Well, in case anyone is interested, I just answered my own question. I found an article on migrant and native fertility in Greece. Actually it is pretty much what we would have expected based on the way the conversation has been going here, Bulgarians have lower fertility than native Greeks, and Albanians higher, Also they report that over time the diverse ethnic groups are coming nearer to the Greek average. So it does matter where your migrants come from, but the "bang for the buck" doesn't last very long seems to be the message. Of course Randy's point about France might well be that migrants there would move towards the French general pattern, which means that we shouldn't be immediately optimistic about the fertility of migrants arriving in Bulgaria as a positive factor, unless the Bulgarians themselves manage to shift their underlying fertility upwards. Anyway, for what it is worth, here is the abstract to the Greek study. This article examines fertility patterns and differentials between native women, and Albanian and Bulgarian immigrants, using data from the 2001 census of Greece on the reported numbers of children ever-born alive by citizenship. The analysis focuses on changing fertility timing and quantum of women born between 1950 and 1970, and reveals that cohort fertility is highest among Albanians and lowest among Bulgarians, while levels for native women are somewhere in between. 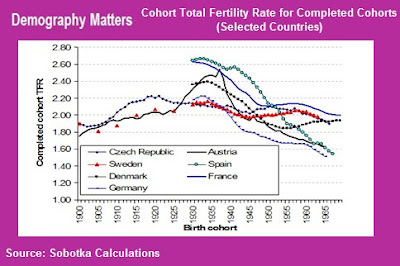 Completed cohort fertility is decreasing over time for all nationalities, while the gap observed among the ethnic groups has been narrowing. Evidence based on the 2001 censuses of Albania and Bulgaria indicates that immigrants in Greece constitute, to some extent, selected groups, compared to the inhabitants of their countries of origin. Also I just found a number for Russian migrants which I hadn't seen before (in this article). Until this year, almost all foreign employees in Russia were part of the "grey" economy. They were exploited by businesses, paid miserable wages and were vulnerable to harassment by the Russian police. To give them legal status, the Russian Parliament passed a law in January 2007 that sets quotas nationally and by region. This year, the quota was 6.1 million workers, with 700,000 for Moscow, according to Andrei Markov, a World Bank human development specialist. It can take weeks for migrants to move through waiting lists at the Federal Migration Service, during which they cannot be legally employed or housed. "The law is still raw,"
So we could estimate that there are something like 10 million migrant workers currently in Russia. Many of these will have left their wives and families back home, but by no means all will have done so. Again, we simply do not seem to have numbers to get a clearer picture here. Incidentally the IHT article is not too bad, and is running some of the same arguments I expound at much greater length in my "Russian Inflation, Too Much Money Chasing Too Few People?" post. 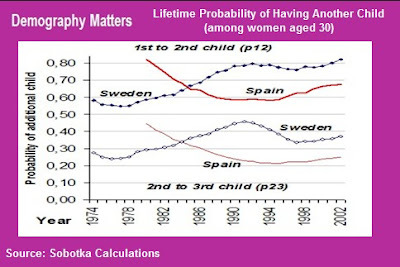 Well sorry to be banging up the comments column, but this topic has got me moving and I am busy Googling, and I just found this old study on Germany which really confirms what we are saying, and gives some indication of the extent of the fertility problem which there is in Germany right now. The Fertility of Migrants Before and After Crossing the Border: The Ethnic German Population from the Former Soviet Union as a Case Study, by R.H. Dinkel & U.H. Lebok. Empirical data on persons of German ethnic origin migrating to Germany from the former Soviet Union are used to calculate their relative ferility levels before and after arriving in their new host country. Despite small numbers in the survey , a suitable method was used to effecitvely compare fertility before and after crossing the border with an index measure of national fertility rates. A relatively strong fertility decline was observed for German origin migrants (Aussiedler) from the former Soviet Union during their first years in Germany. More interesting, we consider, is how and to what extent the change in living conditions affected reproductive behaviour after arrival in Germany. 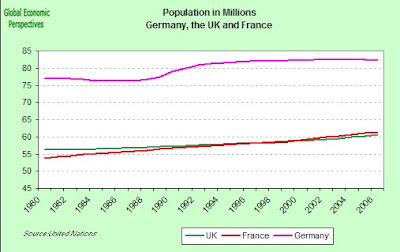 Surprisingly, the fertility of this former high-fertility population fell to a level much lower than the already low German fertility. The extraordinarily high fertility levels of certain religious groups within the former Soviet Union fell even more rapidly after arrival in their new home country. The results of the study may shed light on another development in Germany: that immediately after reunification the total fertility rate in the former GDR fell to the extremely low level of about 0.6 in 1993 and 1994. The experience of the former East German population is therefore similar to that of German-origin migrants from the former Soviet Union. "Immigration doesn't solve the low fertility issue, but it can help plug gaps during the postponement process. But.... to do this adequately you need immigrants from higher fertility societies, not lower fertility ones." What we seem to be seeing is that your own domestic patterns also matter, and that some aspects of the situation become win-win, in that if you have relatively high native fertility, and attract migrants from relatively high fertility societies (the US and Latinos is of course a good example here) then this is the best path of all. And those of you who are wondering about why the hell all this matters, go back to the original post and look at those comparative per capita income charts. 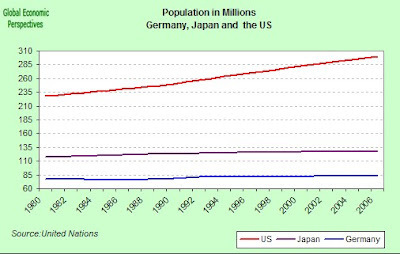 For pension and health systems in Japan and Germany to become sustainable something needs to happen. Better put it should already have happened, but still, the longer people keep saying "it doesn't matter" the worse it is going to get. 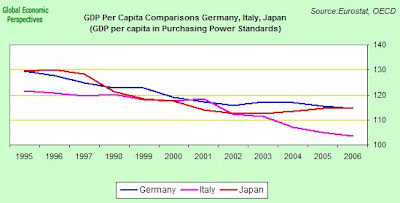 Somehow it seems to me to be deeply symbolic that while all the attention is currently focused on the fact that the US economy is in all likelihood entering recession right now, very little ink indeed is being spilt on the fact that Germany and Japan are also doing so, and without domestic sub-prime housing busts. Why? Because their economies are endemically dependent on exports for economic growth, and they dependent on exports because, quite simply, they have allowed themselves to age - as populations - too fast. What is so striking about Gambians in Spain is that they appear to have by far the highest fertility rates for any national group in the country. Based on the 2001 census, we estimated the total fertility rate of the Gambian-born population, using the “ownchild” method, to be 3.67 children per woman for the period 1996-2000. Gambians have a TFR in Spain that is much lower than in The Gambia: 5.46 in 2004.14 Still, it is considerably higher than any other immigrant group of any numerical significance. Senegalese are next with a TFR of just 1.92, followed by Moroccans and Algerians with 1.50 and 1.28, respectively. So Moroccans have a fertility of 1.5 in Spain, much lower than in France I think - and lower, of course than in Morocco - which sort of reinforces even further Randy's point that the local fertility culture matters. Moroccans are reasonably significant in this context since they have been coming to Spain since the early 1990s. Also, as must be evident, the data in Spain is reasonably clear since we are talking about first generation migrants, and the question of "naturalisations" hasn't had time to raise its head sufficiently to confuse things. Actually, I may be sitting on a missing link here since I have a paper on my drive which specifically addresses (or tries to operationalize) the effect on fertility from migration. 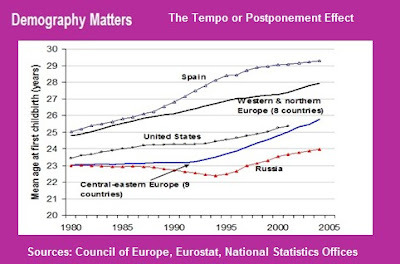 It actually postulates that Spain has had above replacement fertility as a result of the migration flows. I am not sure about methodology they use yet but I will have a closer look and then I will come in with a post here. The thing is, as also indicated by Edward's links. There are dual processes at work I think. 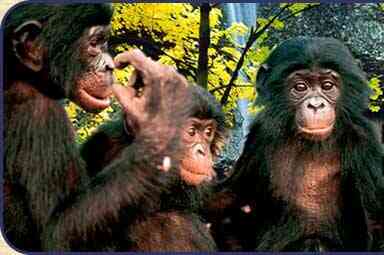 Firstly, what is the extent to which immigrations bring with them their native fertility behaviour (i.e. as with the Russophones in Estonia) and what is the extent to which the immigrants are assimilated into the existing fertility regime in the receiving country? I mean, this may be a win-win situation for some receiving countries in the sense that the immigrants themselves adopt the fertility behaviour of the country to which they are going. 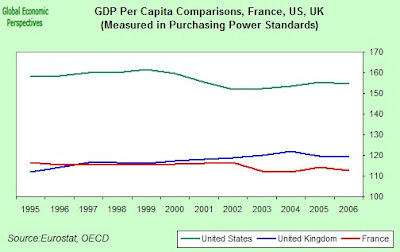 Thus, if you are France or the UK you are in a good position. I am putting this forward since I saw a small piece on the BBC a while ago which suggested that births were on the rise amongst Eastern Europeans residing in the UK. Of course, these are the kinds of issues we, here at DM, feel the World Bank should have treated in their big piece on migration flows in the CEE economies since it is a damn important perspective.The point is I think that Estonia would like to 'import' migrants from high fertility countries as an all things equal alternative to importing from Russia where fertility is lower. However, what are the dynamics between the behavior which the migrants bring with them from home and the behavior already existing in the receiving country? And lastly and ever so important, what is the rate of 'convergence' so to speak, if at all(? ), to the receiving country's fertility regime. The paper Edward notes on Greece seems to offer some initial evidence. @antiglobalist: there are two ways life expectancy affects the dependency ratio. Firstly children are dependants: this is a serious burden in countries with high fertility and low life expectancy, and partly explains why they have so much difficulty creating a functioning education system. As a result the population is stuck at the bottom of the skills ladder (which unfortunately seems to lead to high fertility in the next generation, creating the high fertility trap.) Secondly, people tend to be too weak or ill to work for a period at the end of their life - all of us die somehow, but relatively few die suddenly. The real cost of too many old people comes from the ones who have chronic and expensive to treat illnesses which are nevertheless not immediately fatal. So if life expectancy is low due to 60-year-olds getting shot in the head, then yes, it does reduce the level of dependency. (If it's young people getting shot, as is the case in reality, it increases dependency because they spend so much of their lives as children.) But if life expectancy is low due to cancer, AIDS or alcoholism, it means there are also large numbers of people who are unable to work but still alive, and they have to be looked after somehow. Hi, I see your point, however I'm not too convinced into it. For one thing, don't underestimate the pension costs. If one goes to retirement with 60 years, and receives pension for another 30years till his final age of 90: I don't think that this can bi insignificant.